Like President Trump, all four took the ancient oath of office in times of national challenge, capturing in their inaugural address rhetoric moments of historical inflection. 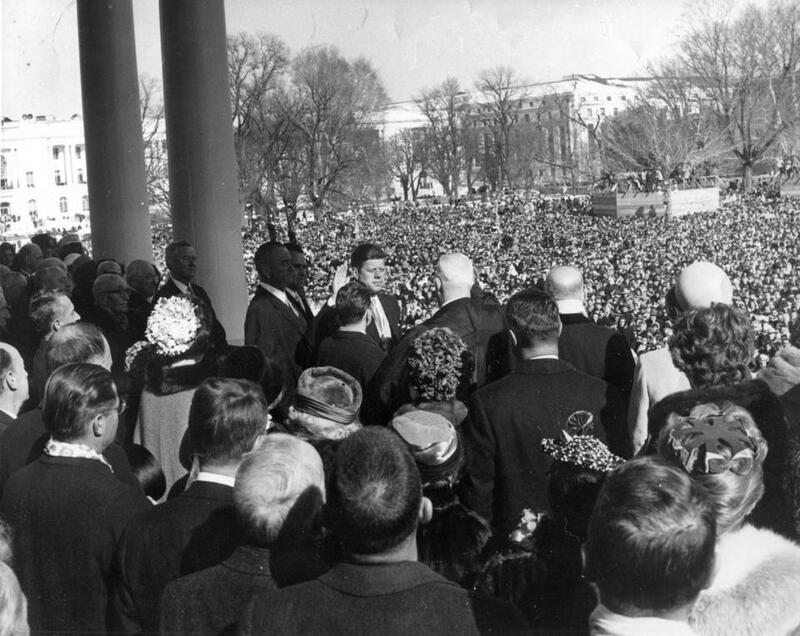 Their first inaugural addresses — Kennedy did not get a chance to issue a second — set the tone and timbre for the remainder of their presidencies. All were trying to mark a shift in the national narrative, and only the long view of retrospect told whether their remarks met the moment. 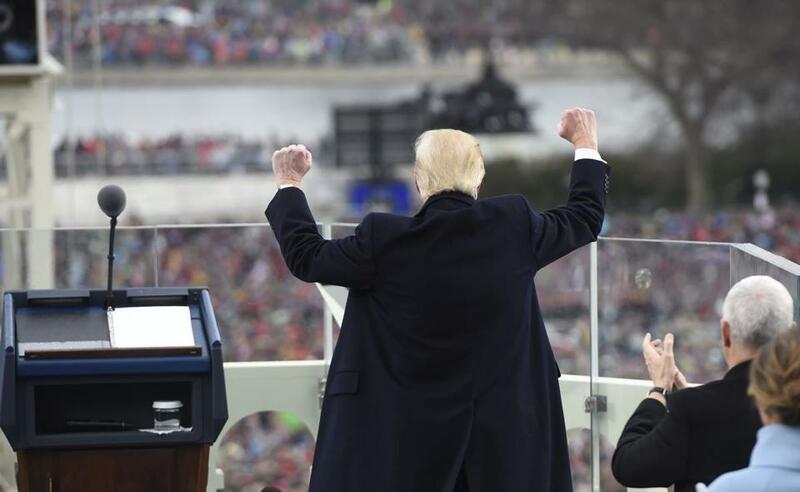 The Trump inauguration represented a dramatic departure from the status quo, and so, too, did his inaugural address, which had the air of a primary-season rally and which bluntly criticized “a small group in our nation’s capital [that] has reaped the rewards of government while the people have borne the cost’’ — a broadside issued while he was within feet of that very small group. Friday and Saturday put on display the wounds that were broken open by the election. Trump sought, in his own terse sentences and blunt words, to mark the end of what he declared a time of America getting pushed around, economically and on the world stage, and the start of something else: America first. 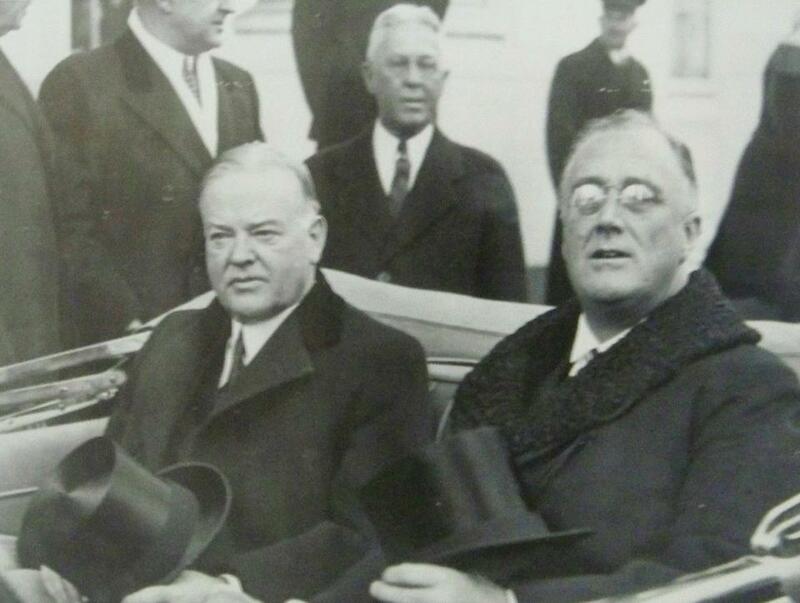 President-elect Franklin D. Roosevelt and outgoing President Hoover en route to the 1933 inauguration. 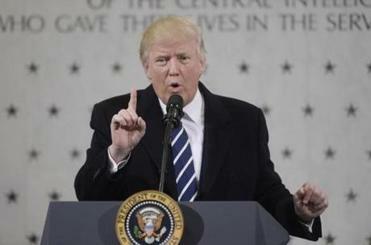 The 45th president took office amid one of the many contradictions that mark a complex country like the United States, for he was the beneficiary of an insurgency of the angry in a country where the president he replaced left by helicopter from Joint Base Andrews with an approval rating of 57 percent, according to the most recent Gallup Poll. Trump’s approval rating is well below that, and indeed his stunningly high unfavorable rate, as measured by the Wall Street Journal/NBC News Poll, is exactly three times higher than the 16 percent registered by Bill Clinton in the same poll in 1993. On taking office, Trump was informal, almost casual; he is the only president to be inaugurated in an unbuttoned suit coat, a dramatic contrast with Kennedy, who wore the traditional morning coat in 1961. In his speech, the new president was forceful, even pugilistic. He expressed determination; he used the word “will” 39 times. And he sought to identify his steel-and-concrete pragmatism and two-fisted confidence — “we will get the job done” — with enduring American values. In truth, that’s what classic inaugural addresses do. “The inaugural address should be a banner of intent and an expression of reassurance that those values we stand for and live by are not going to blow away in the wind,” said David McCullough, the Pulitzer Prize-winning biographer of John Adams and Henry Adams, in an interview. That could have been part of Trump’s inaugural address, but it wasn’t. It appeared in the middle of Barack Obama’s first inaugural address, in 2009. These addresses sometimes open with reassuring grace notes: gracious expressions by successors to predecessors that underline the great continuity of the presidency. 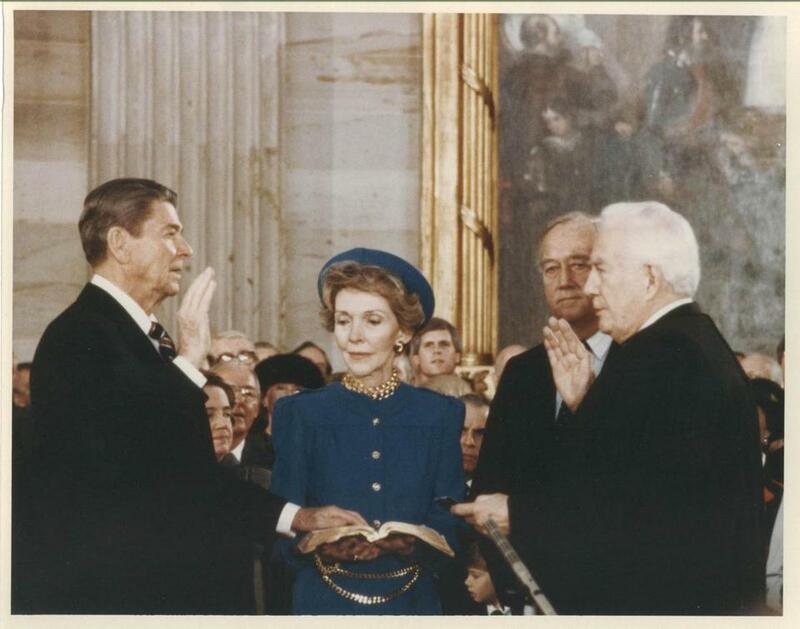 President Reagan took the oath of office at his second inauguration. Trump thanked the Obamas for their “gracious aid throughout this tradition.” But the rest of the speech was so forceful a repudiation of the Obama years, the Obama record, the Obama outlook, the Obama style, and the Obama ethos, that the former president seemed to struggle to repress a cringe. Presidents often come to office on the winds of popular movements; FDR did in 1933, so did Reagan in 1981, and so, too, did Trump last week. But those who don’t do so — Lincoln was a minority president and Kennedy entered office after a remarkably close popular vote — sometimes acknowledge that presidents have limitations, and that in the American system the public has an important voice beyond simply voting. Separated by exactly 100 years, Lincoln and Kennedy used remarkably similar language to underline the shared responsibility of leadership that is an American tradition. Inaugural addresses, even more than set-piece speeches such as the State of the Union addresses that presidents deliver annually, are important markers in the lives of both country and chief executive. For that reason, they often bear the rhetorical fingerprints of the new president and reflect the personalities of the president. US Supreme Court Chief Justice Earl Warren (center) administered the oath of office to President Kennedy in 1961. Friday’s speech was pure Trump, more adamant than eloquent, with little evidence outside a few lines of speechwriters’ influence; it substituted puglism for the lyricism that most other presidents have sought to achieve. 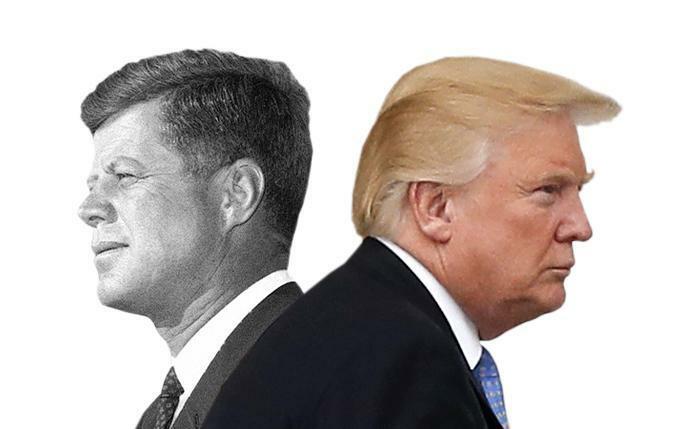 But the new president clearly did examine the inaugural addresses of two of his relatively recent predecessors: Ronald Reagan, whose speeches resonated with the public because of their simple, approachable language, and Kennedy, whose inaugural address is regarded as a classic of postwar American rhetoric. Kennedy’s signature challenge — “And so, my fellow Americans: ask not what your country can do for you; ask what you can do for your country’’ — is a touchstone for nearly every inaugural address that followed, just as the first inaugural address of George Washington has been an enduring touchstone for all presidents. Indeed, in so many ways — the two-term tradition, broken only once; the general refusal of presidents to testify on Capitol Hill, broken only in extremis by Lincoln, Woodrow Wilson, and Gerald R. Ford — American political customs originated with George Washington and extend in a line that now includes Donald Trump. Trump, not known for modesty or for professions of incapacity, issued no such disclaimer, but nonetheless repeatedly argued that it was the public, not the Washington grandees gathered around him, who matter the most now. A final element of memorable first inaugurals is especially appropriate for our fraught time: expressions of determination and confidence that a battered nation will fight on, militarily or spiritually, to conquer its enemies or its demons. 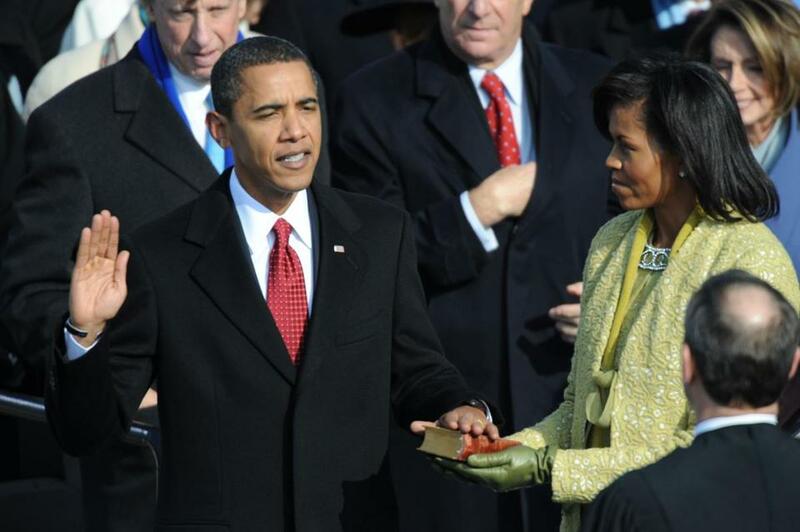 President Obama took the oath of office at his first inauguration. But the 44th president gave way to the 45th in a time marked by petty grievances and recrimination and, at least from Trump’s point of view, worn-out dogmas. This age lacks the graciousness of earlier times, even eras of tumult. One long-forgotten anecdote from nearly a half-century ago, makes the point. When Lyndon B. Johnson left office in 1969 amid enormous unpopularity and in a period of national upheaval, a second-term Republican congressman from Houston left the Capitol for Andrews Air Force Base to bid farewell to the battered Democratic president, whose approval ratings had dropped 34 points since he took office. “I remember the warm glow Lyndon and I felt when we learned that a young Republican congressman, George Bush, had been in that assemblage, rather than at the inaugural activities of a president of his own party,’’ Lady Bird Johnson recalled later. No such gesture occurred in inaugural festivities in our age of anger and resentment. Before Bush’s airbase farewell to the Johnsons, Nixon, in his first inaugural address — delivered in a time of even greater distress and division than our own — spoke of “a long night of the American spirit’’ and he bid Americans to turn from their differences and to unite. Today no one remembers nor cites those words, the Nixon legacy having been subsumed in scandal and his matchless disgrace. President Trump celebrated after his inaugural speech on Friday.